The flyer says it all. 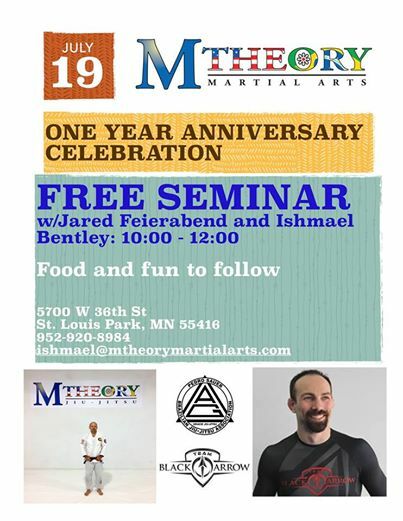 This Saturday, July 19th, M-Theory BJJ (owned by Pedro Sauer 2nd degree black belt Ishmael Bentley) will be celebrating its one year anniversary. As such, there will be a free seminar put on by Professor Bentley and Professor Jared Feierabend of MI-Q. The seminar will start at 10am and go until 12pm, followed by rolling and food/refreshments. Come one, come all to a great gym and a great opportunity!